14U Boys Follows Silver February With Gold March (to Provincials) ! 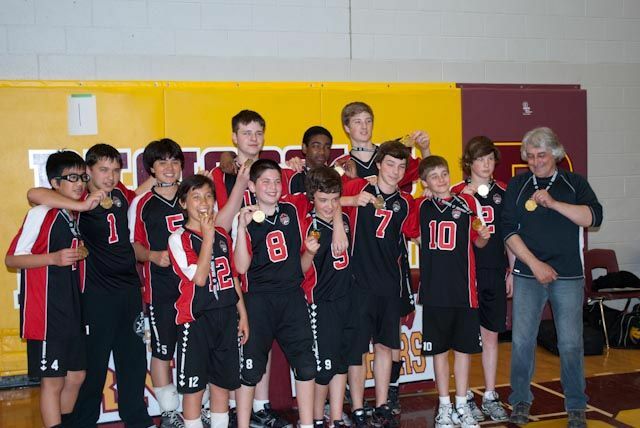 March 29th, 2012 DA 14U Boys Takes Gold in Kingston! After a Silver Medal finish in Ottawa last month, the 14U Boys rolled into Kingston for the Hawkin’s Cup as a quietly confident squad. They had been improving each week, while quickly adpating to Coach Lawrence’s new offensive strategy, and they were looking forward to the return of a couple of key players from injury. The boys backed up this quiet confidence with swift and efficient execution during pool play, finishing first in their pool without surrendering a set. Next up- Scarborough Titans. The Attack’s pinpoint serves and dominant middle attacks were no match for the team from Scarborough, as the Attack moved onto the Semi’s with straight set victory (25-8, 25-11). In the Semi’s the boys came up against a tough Northumberland team. The Breakers presented a tough challenge in the first set, but a timely timeout by Coach Lawrence helped propel The Attack to a first set victory (25-19). They followed with a dominating second set win (25-17), to move onto The Finals. The Gold Medal Match featured The Attack vs. Markham Stingers. This matchup has become a bit of a rivalry (move over Louisville/ Kentucky), ever since our boys took gold at the Stinger’s tournament at the start of the season. This turned out to be a scrappy match, with long rallies and several lead changes. The Attack had to work hard with excellent defensive hustle, and an aggressive serving game to win the first set 25-21. The Markham Stingers came storming back in the second set leading The Attack by 6 points late in the set. This match was sure to go to a tie break… But, our boys showed incredible grit in clawing their way back to a 24-24 tie. With the momentum now in their favour they won the second set 26-24. At the end of the day, our boys departed Kingston without having lost a set! Here’s hoping the successful outtings in February and March can propel the 14U Boys to even greater heights as they enter the upcoming Provincials in Waterloo. We wish them the very best of luck! DA Boys 14U Black Wins GOLD! Nov. 21st, 2011 DA Boys 14U Black Wins GOLD! 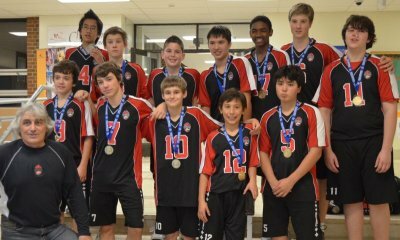 The Durham Attack Boys 14U win Gold at the 2011 Provincial Cup in King City, ON. The first tournament of the season, of the Triple Ball format, saw the boys dominate their pool play and move on to win all remaining playoff games on their way to Gold. Losing only 2 sets the entire day, the boys met each subsequent challenge with enthusiasm and confidence, increasing the caliber of their play to equal (and better) their opponent. During each set in the Semis and Finals each point was rigorously contested, and all of the sets were close. Durham Attack would like to salute all the teams that participated in the Provincial Cup Tournament with a special “tip o’ the cap” to the Markham Stingers and Aurora Storm clubs. Amazingly accurate passes on a regular basis from Tyson, Steven and Justin that provided feather touch sets from Ehron and Adam, only to lead to unblockable kills by Jordan, Rylan, Caleb and Marcus. Our quicker guys never let a ball hit the floor without effort, and our “big guys” all blocked for points when they were most needed. Coach Lawrence calmly providing encouragement and correction when needed, while at the same time he should be commended for just letting the boys play. The games also provided some gutsy performances in spite of injury, with Marcus battling tendonitis in his knee and saving some of his hardest kills for points when we needed them most. Caleb also played through a bloody nose in the Final received by way of a Jordan serve that popped him in the beak during warm-ups. Who would have thought that a rolled up piece of bloodied tissue wedged up Caleb’s nose could provide such great drama, while surely intimidating the opposition at the same time? You can remove the tissue plug now Caleb. Congratulations Fellas… Keep up the great work.